Not long ago, I came home with these goodies from the very first local event I have ever attended in my few years of blogging. I am certainly curious about these delicacies and admires the dedication of the people who made them and who aims to preserve these delectable and historic Bulacan heritage cuisine. These food items, you see, were originally prepared by Maloleños back when our country is struggling to break free the Spanish regime. These local food treats were most probably the same items in our great heroes’ meals and menus. The pastries, gurgurya and binanli, are instant hits at home, given that we all love breads and similar food items. They are perfect coffee companion and are great to serve during breakfast or snack time. I have yet to try the Atsarang Dampalit, though, and am wondering with which dish to pair it best. Do let me know if you have tips and ideas. 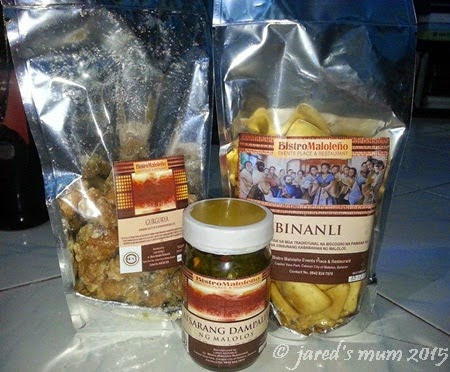 These age-old Bulacan goodies, by the way, are made by a local restaurant, Bistro Maloleño. Apart from these, they also have interesting items on their menu, including Emilio Aguinaldo’s favorite, nilagang manok sa puti with asparagus, and Pochero ni Plaridel, a favorite of one of my favorite heroes, Marcelo H. del Pilar. I have not been to this local resto, so I hope to visit the place one of these days. If you are intrigued as I am with these heritage dishes, I suggest you drop by the place when you find yourself wandering in the city. This entry was posted in foodie finds and tagged breads, Malolos food crawl on 28.February.2015 by admin. I had the chance to dine in at Bahay Na Tisa in Malolos City when I attended the local presscon for the upcoming Fiesta Republica 2015. I am a Malolos residence since time immemorial but I have never tried this local resto before. The place has such a lovely facade and I wonder why I did not discover it sooner. I was not able to take photos of the outside as the presscon was about to commence when we got there so I got one from Wikimedia Commons just to show you how it looks like. I am not familiar about their regular menu, though, but our meals for that afternoon included these delectable dishes ~ callos and hamonado. It was my first time to try callos and I loved it! They served local dishes in line with the theme of the event and our full platter included a cup of steaming nilagang manok, okoy, and as mentioned, callos and hamonado, and, of course, paired with a cup of steam rice. I was very full by the time I finished my meal and I cannot exactly tell which of the stuff I ate is my favorite! I love okoy and theirs is just delicious! But I guess it was the callos that won me over. I loved the olives in it! Although the place was packed at the time with local government officials and people from the media, I did have a very lovely dining experience. I love the food! I also enjoy the beautiful ambiance, especially when there was a singer serenading everyone with my favorite Ed Sheeran song while we were eating. 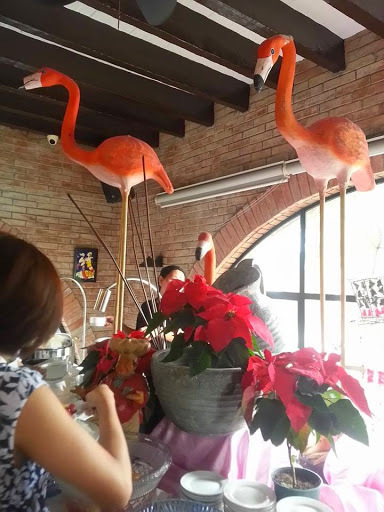 I also love these flamingos that adorned the buffet table, as well as these beautiful poinsettias that remind me of my gorgeous pot at home. Judging from the buffet they served at the time, I thought it will be a great idea to go back there at any given time. I just wish they would do something about the second floor loos, as a well-kept comfort room is a must in any establishment. Other than that, I give this place two thumbs up! 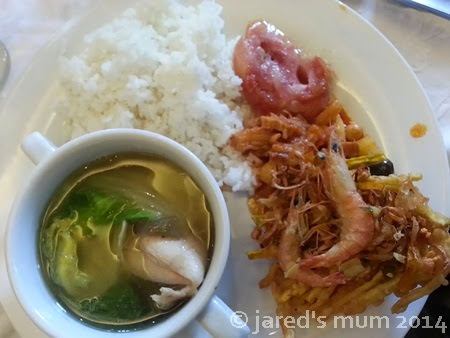 This entry was posted in foodie adventures, foodie finds and tagged Filipino dishes, Malolos food crawl, restaurants on 10.January.2015 by admin.